Today, another from the latest creations by Coney - A three-wheeled "roadster" or trike, called Spyder and sold under the Can-Am brand. The Can-Am Spyder [1, 2, 3] is a three-wheeled motor vehicle with a single rear drive wheel, and two wheels in front for steering. It is produced by Bombardier Recreational Products, Inc. (BRP) a Canadian company . 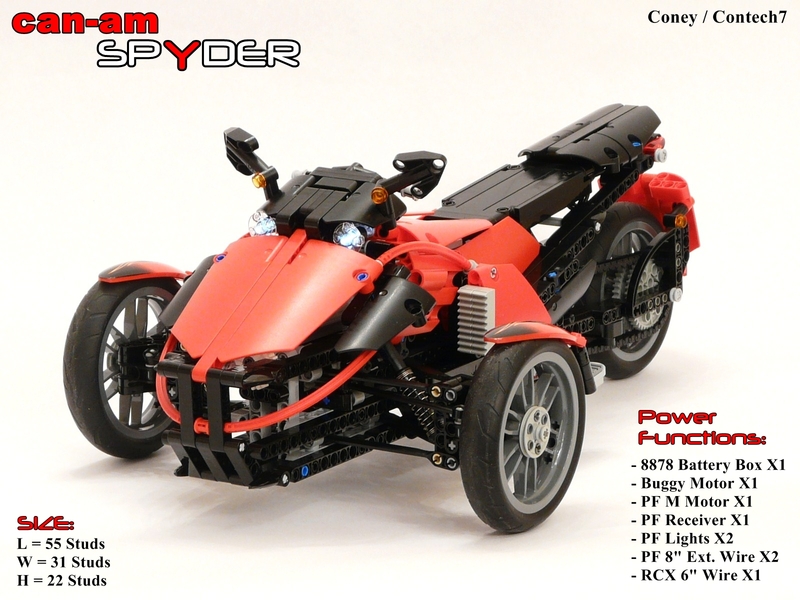 Can-Am Spyder is a full functional, fast and remote controlled vehicle, with forward / reverse, front steering, full suspension, front and rear lights. Contech published a sequence of photographies to assist those who may want to build a replica or a similar vehicle. Click on the image bellow to see them. You may find additional photos from this model at Coney's Brickshelf folder. This is fantastic. Great looks, great techniques, great pictures. That is really what technic is all about! Lots of functionality with some great looks! That looks beautiful, very nice work.